My stay in Hong Kong was great and not only because I landed there bright and early on the morning of my 43rd birthday...It's actually an amazingly awesome city and I had equally awesome hosts! Thank you so much Steve for showing me around and taking me here and there and lugging my 55 lb. suitcase up (and subsequently down) 5 flights of stairs!! After unloading my stuff at his place, we walked to The Peak which gives stunning views of Hong Kong. Unfortunately it was an overcast day, so to get an idea of what I missed, here's a photo I found online which gives the full view possible on a clear day (or night). I then checked into my room at The Bridal Tea House Hotel...by the size of the room, I'm guessing it wasn't the honeymoon suite! Seriously, this is what you call a BEDroom! After crashing at 3:30pm and not getting up until 8am the next morning! I was very well rested and ready to jump start my day half way around the world. I met up with the awesome team from the SAKKA Foundation who currently supports two boys from Wat Opot who are now attending university. We discussed other ways in which they can help the WOCC kids out. After the meeting I just walked and walked (and metro'd and metro'd) all over the city. This place has one of the most amazing and simple metro systems. And definitely the CLEANEST as well! Not only is it super clean, well organized and brainlessly simple, it was also practical! Who'd a thunk it? An umbrella machine complete with a video of how to use one...for those mechanically challenged. Late afternoon I headed to the Avenue of the Stars (Hong Kong's version of the Hollywood Walk of Fame). I walked up and down the pier just relishing in the peacefulness of it all. Walking along a body of water, regardless of where I am or how many hundreds of people around me; I always feel at peace. This experience was no different. That evening, I settled in amongst the crowd to watch Symphony of Lights from across the water. Buildings on the other side lit up (lasers flashed) to the tune of music blaring loudly. The next day I again met up with Steve and Brian as they hosted a wonderful "penthouse" party on their roofdeck (although I pooped out while the party was still going strong). Good food, good drinks and wonderful wonderful people! 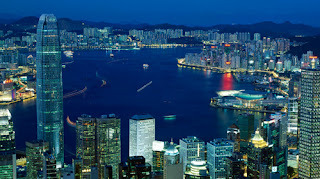 I may make Hong Kong another future destination! Cant believe you are 43. Happy Birthday.